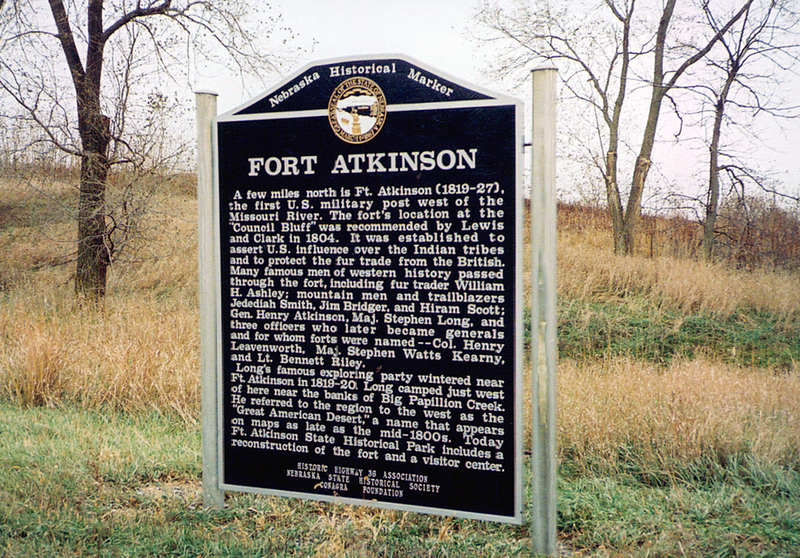 A few miles north is Ft. Atkinson (1819-27), the first U.S. military post west of the Missouri River. The fort's location at the "Council Bluff" was recommended by Lewis and Clark in 1804. It was established to assert U.S. influence over the Indian tribes and to protect the fur trade from the British. Many famous men of western history passed through the fort, including fur trader William H. Ashley; mountain men and trailblazers Jedediah Smith, Jim Bridger, and Hiram Scott; Gen. Henry Atkinson, Maj. Stephen Long, and three officers who later became generals and for whom forts were named--Col. Henry Leavenworth, Maj. Stephen Watts Kearny, and Lt. Bennett Riley. Long's famous exploring party wintered near Ft. Atkinson in 1819-20. Long camped just west of here near the banks of Big Papillion Creek. He referred to the region to the west as the "Great American Desert," a name that appears on maps as late as the mid-1800s. Today Ft. Atkinson State Historical Park includes a reconstruction of the fort and a visitor center. “Fort Atkinson,” Explore Nebraska History, accessed April 19, 2019, https://mynehistory.com/items/show/189.